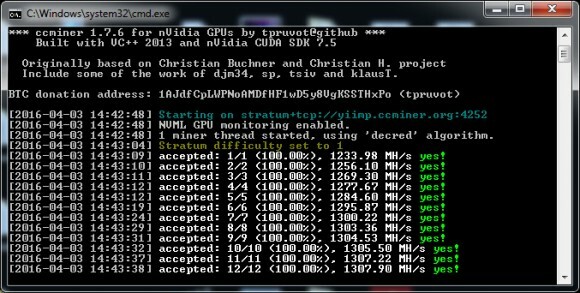 A quick update with a new Windows binary compiled from the latest ccMiner 1.7.6-git fork from tpruvot (source) with some improvements regarding the Decred (DCR), the latest pull request submitted by pallas that can provide up to 10% performance increase. The release below includes two versions of ccMiner, one is 32-bit binary for Windows that is compiled with CUDA 7.5 and with support for Compute 2.0 or newer Nvidia GPUs, and another that is 64-bit Windows binary compiled with CUDA 7.5 for Compute 3.5 or newer Nvidia GPUs. 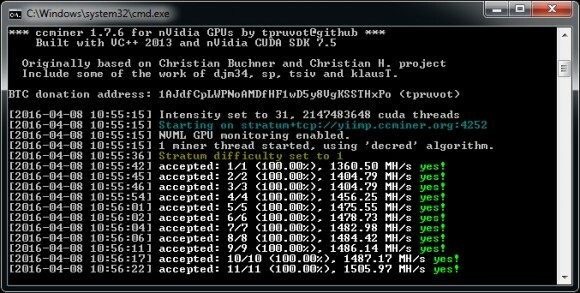 Do note that if you have a newer Nvidia video card you should use the 64-bit CUDA 7.5 release as it is providing better hashrate than the 32-bit CUDA 6.5 binary. It seems that the speedup works better for Linux than on Windows, the hashrate increase under Windows OS much less than the improvement under Linux. 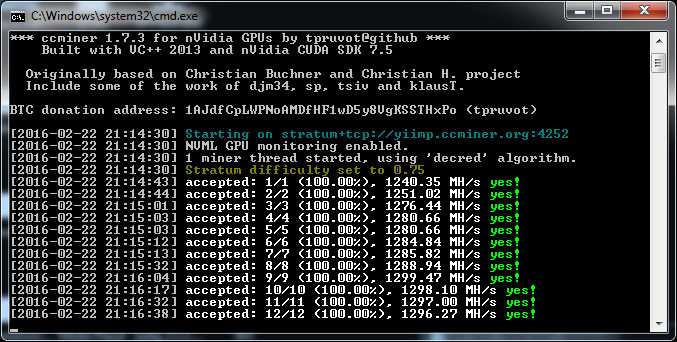 Update: Binaries have been recompiled and should now provide a bit more hashrate for Windows users than the previous release.